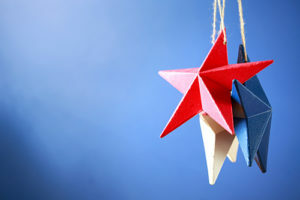 Hey, La Grange, IL home sellers, let’s decorate your home for Independence Day! There are plenty of things to do to increase your curb appeal, like beautiful landscaping, a fresh coat of paint, and keeping the exterior of your home clean and well-maintained. But if you really want to highlight your home this holiday weekend, try a few of these ideas to make your home stand out. If your front door needs a new coat of paint anyway, try a bright red or navy blue if it fits with your exterior paint scheme. Add some temporary decals with stars and stripes for extra fun. Don’t want to repaint? Party supply stores sell door covers you can use for a few days and then remove. Not just for Christmas anymore! Wreaths are a quick and easy way to update the look of your home with the seasons. Check out your local craft store for a blank wreath and fun accessories to add. Then break out your hot glue gun and get creative. Not feeling very crafty? Head downtown to peruse the shops or over to the Jackson Square Mall for every interesting thing you can imagine. 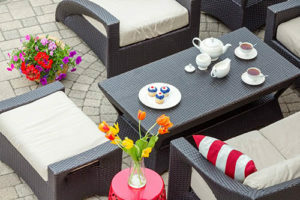 Red, white, and blue flower pots bursting with with summer color are sure to draw the buyers in. A great idea circulating the internet right now is to hide your hose in a giant empty flower pot to increase that clean, organized look of your home from the curb. And if you love flower pots and other types of ceramics, you can even beat the heat and get creative at the Ceramic Art Cafe right here in La Grange. You pick the piece that appeals most to you, design it, paint it, and leave it with them to fire in their kiln. Pick it up in about a week, and you’ve got a beautiful new work of art for your home! Want fireworks at your doorstep? Welcome your guests and potential home buyers with a bang by putting out a 4th of July themed welcome mat! Invite potential home buyers to imagine themselves relaxing on the front porch on a pretty bench. A white one would be ideal to add red and blue cushions and pillows decorated with stars, stripes, and bursts of fireworks. While we want home buyers to see a blank slate when they walk in, we also want to enjoy our homes while we are still living in them. So assuming you’ve already cleared the clutter and removed the family photos, there are some fun things you can add to celebrate the holiday and invite home buyers to think about how much fun they would have decorating if the home belonged to them. Pinterest is full of fun ideas. Just remember–don’t go overboard. Keep it simple and tasteful. Try a big vase of flowers in our nation’s colors. Floral shops usually sell red, white, and blue carnations this time of year. Be sure to visit Kim Lesher at Bloom 3 right here in La Grange for ideas and beautiful flowers. Flags always make a place look patriotic. Try collecting several parade flags and arranging them in a red, white, or blue cut flower vase. Or fill a few mason jars with white sand, top the sand with red and blue rocks or marbles, and poke a parade flag or two into it. Add Independence Day-themed tablecloths, runners, and place mats to your dining room table and sideboards. Visit the La Grange Farmers Market on Thursdays for a big bag of cherries. Wash and dry them, and then place them in a pretty bowl on the table or counter. They will look pretty and festive, and you and your family can snack on them all day. With a reputation for integrity and professionalism, Coldwell Banker Realtor Nancy Miller knows what works. She has been helping people buy and sell homes in the La Grange, IL area for over 25 years. Find out what others say about her here. Then reach out to her today. She would love to grab a coffee with you!